* Coral Bingo Terms: (Welcome Bonus) 18+. New customers only. Min spend £5 on Bingo tickets. 30 days from registration to qualify for £25 Bingo Bonus. 2x wagering applies. Valid 7 days. (Free Bingo) Available for 7 days from sign up. Farley & Carly Room opens 12:00-14:00 & 18:00-20:00 (UK Times). Winnings credited as bonus. T&Cs apply. Coral Bingo has raised the bar and established itself as one of the best UK bingo sites with its revamped design and new look. Powered by the Gala Coral group, and incorporating software from the leading bingo provider Virtue Fusion, Coral offers a high quality and fun-packed online gaming experience. Coral Bingo’s fresh design has a clean and easy to navigate interface which greets you with the hottest bonus offers, bingo schedule, top games, and jackpot live feed. It’s easy to find the games you want to play and discover the latest happenings on Coral Bingo as soon as you enter the site. It’s definitely worth a visit to Coral Bingo to discover an eclectic bingo games variety, mega jackpots, amazing promotions, active chat, and much more! One of the best things about Coral Bingo is the Welcome offer where you can play with £30 for only £5! While most brands have a first deposit minimum of £10, with Coral’s lowered minimum you don’t need to spend a lot to start playing. As a new player, you also get 7 incredible days of free bingo for a chance to grab amazing prizes. Farley & Carly room has over £8,000 up for grabs and the Allsorts Room offers £2,500 in free games! Coral Bingo Terms: (Welcome Bonus) 18+. New customers only. Min spend £5 on Bingo tickets. 30 days from registration to qualify for £25 Bingo Bonus. 2x wagering applies. Valid 7 days. (Free Bingo) Available for 7 days from sign up. Farley & Carly Room opens 12:00-14:00 & 18:00-20:00 (UK Times). Winnings credited as bonus. T&Cs apply. 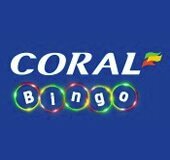 Coral will treat you to a wealth of promotions like the Coral Bingo Soap Night where you can grab instant bonuses while watching your favourite soaps! . You can also navigate your way through Coconut Island to unearth the £3,000 Tropical Bounty. There are plenty of seasonal promotions like the £500K Value Christmas and the Coral’s Christmas countdown. You can then play awesome games like Cash Cubes with a £50K giveaway. Other themed specials include £100K monthly specials, the Nightowls £10,000 guaranteed promo and the chance to ‘beef up your bingo wins’ with Side bets. You can also win FREE bingo bonuses in the Daily Piggy smash, or play Bingoal to score a FREE share of the £500 Bingo Bonus. If that’s not enough, you can then earn loyalty points and bonuses with the awesome Coral Bingo loyalty scheme! You can also pick up the super cool Coral connect card to collect bingo winnings in the Coral Retail store. If you want to get social, you can hang out in the Coral Chat Community to win more exclusive bonuses and games! Coral Bingo boasts a top variety of bingo including 75, 80, 90, 40 and 50 ball bingo rooms like Rainbow Riches plus real-time live rooms. You can have a blast playing on themed bingo rooms like Coronation Street bingo, Coconut Island, Bingo Lotto to name a few. If you’re looking for a complete gaming experience, you can spin to win through exhilarating online slots like Fluffy Favourites and Paradise Reels as well as a vast array of scratch cards, Roulette, Blackjack, Arcade games and more! Experience Coral Bingo on the go when you play on your smartphone or tablet! You’ll find all of your favourite bingo rooms as well fun games like Clover Rollover, Dynamite Digger, and Britain's Got Talent Superstar. There is fantastic selection of mobile slots and casino games to choose from too! The Coral Bingo app is available for iPhone, iPad, Android phones and Android tablet so no matter which device you use, you can play and win on the go! Some of the best perks at Coral Bingo are the low deposit minimum, unique promotions, and 7 days of free bingo with up to £10,000 in potential winnings. Aside from the games selection being similar to sites that run on the same network, there are really only positive things to say about Coral Bingo!